The bloodbath for the detached real estate market of Vancouver continues. The Real Estate Board of Greater Vancouver (REBGV) has numbers that show a sharp decline in prices for November. The decline was largely the result of declining sales, and rising inventory. The price of a average detached home in Greater Vancouver is falling. REGBV reported a benchmark of $1,500,100 in November, which is down 1.6% from the month before. That brings the prices to 6.5% lower from what they were at last year, which is a loss of $107,900. In the city Vancouver West saw the detached benchmark fall to $3,205,500 which is down 10.3% from last year. Vancouver East's benchmark fell down to $1,470,800, which is down 6.5% from the year before. These huge losses may not be over yet. The Greater Vancouver detached real estate sales are dropping fast as well. REBGV has reported 516 sales in November, which is down 18.61% from the month before. 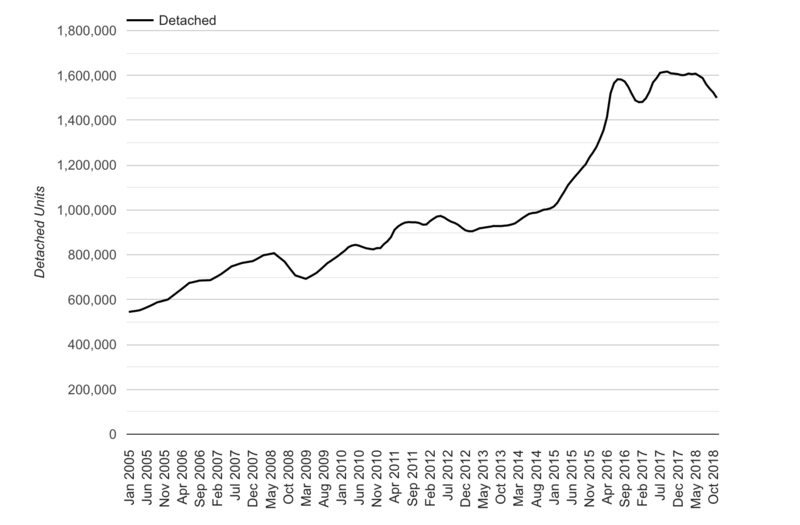 Now detached sales have went down 38.6% when compared to the same month of last year. The monthly decline is seasonally expected, so completely not a big deal. Yet the annual decline is a big deal.